Viva Las Vegas! I always enjoy my trips to Vegas! It’s such a Travelling Foodie destination in my opinion. You don’t need to be gambling to enjoy Vegas. The casinos are attractions in itself even if you don’t play. Then, there are the shows, clubs, and a lot of amazing restaurants. I was in Las Vegas on January 3-10, 2017, particularly for the CES, which took place from the 5th to 8th. Here are the highlights of my trip! As I mentioned, CES was one of the main reasons we went to Las Vegas. You can read my experience of CES here. I just love walking around The Strip to see the different themes of the casinos. At night, The Strip becomes so alive with bright lights! One of my favourites is Paris because of the majestic Eiffel Tower! Check out photos of The Strip I took here. Even during the day, The Strip is a nice place to explore if it’s not too hot! Here we have the beautiful backdrop of the Wynn and Encore together.
. Watching the show just calms me and takes my stress away. All my prior visits have been watching it from The Strip. This time, I got to watch the Fountains of Bellagio from within Bellagio looking out to The Strip. To be honest, I actually love this view even more because it looks even better with the Eiffel Tower in the background! 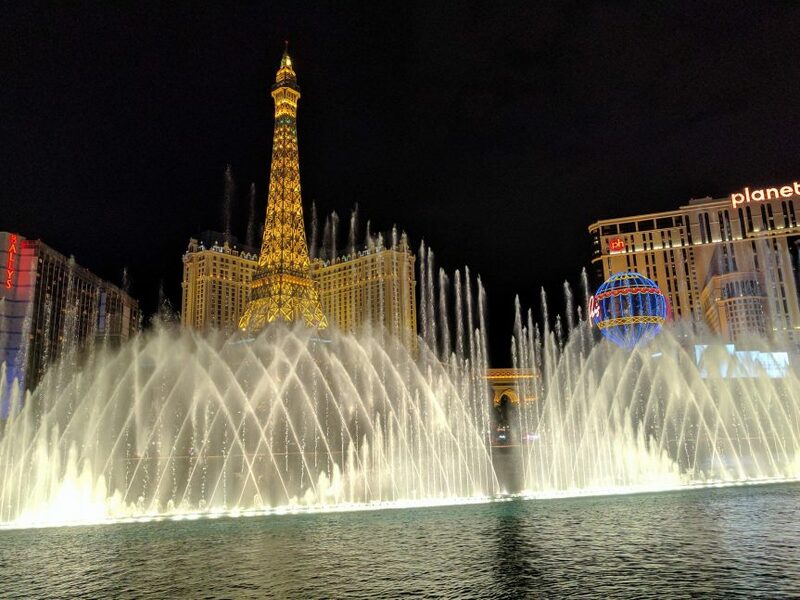 Though I’ve been to The Strip so many times, I actually didn’t know that Wynn has its own version of Fountains of Bellagio called The Lake of Dreams. It’s not as grand as the Bellagio Fountains, but it’s more intimate to watch with its small lake, surrounding trees, four thousand lights, holographics and puppetry. 2017 marks the Year of the Rooster. Around this time is when you’ll see casinos changing their decorations for Chinese New Year. Bellagio’s 14,000 square foot Conservatory and Botanical Gardens get transformed to showcase distinctive sights and a special display for Chinese New Year with traditional designs of celebration. 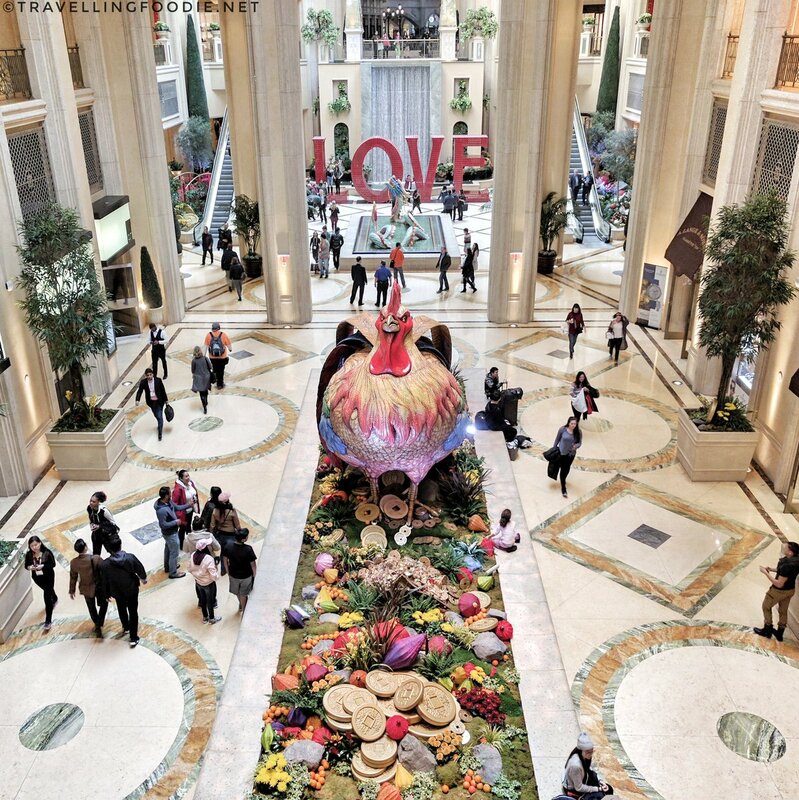 Similarly, The Venetian and The Palazzo commemorates the Chinese New Year by transforming the Waterfall Atrium and Gardens featuring a hand-painted fire rooster which stands 15 feet tall and 16 feet long. Though most people tend to associate Las Vegas with The Strip, Downtown Las Vegas is a must-see as well! Check out what’s so special about Downtown Las Vegas here. You’ll literally feel like a kid in a candy store when you visit M&M’s World Las Vegas. This 28,000 square foot, four-level store is all about the colorful joys of all things M&M’s, and is currently one of three locations in the USA. Main Floor: charms, mugs, personalized key chains, and a lot of souvenirs! like teal, hot pink, lime green, gray and purple! There are also a variety of candy dispensers and T-shirts. Third Floor: You’ll find the first-ever My M&M’s which allows you to put a personalized message in your candies. There’s also a free daily 3D movie, “I Lost My ‘M’ in Vegas” starring your favourite Red and Yellow as they reclaim Red’s “M” logo. How did he lose it? It’s Vegas! He gambled his “M” awway in a roulette game. Fourth Floor: Car buffs will love this floor. There’s the M&M’s sponsored Toyota Camry race car. There are also NASCAR-themed M&M products! One thing about Vegas is there’s always something new or changing everytime I visit. This year, the newest thing I saw is the addition of The Park, which is in between New York New York and Monte Carlo. The Park is an immersive outdoor dining and entertainment district which includes a sports and entertainment venue, T-Mobile Arena. There’s so much great food in Las Vegas! And this trip, I got to try restaurants I haven’t been to before. – Check it out from my post on Downtown Las Vegas. Have you been to Las Vegas? What do you like most about it? Posted on March 21, 2017 by Travelling FoodiePosted in Las Vegas, Nevada, Travel, USATagged guides, restaurants, sights and landmarks.